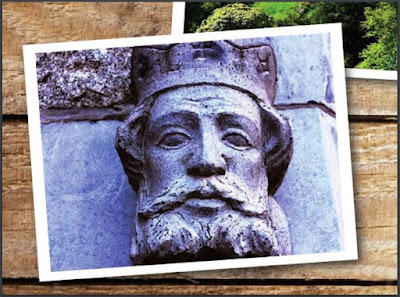 My photograph of a sculpted head of Brian Boru features in a new book on Tara, which is published this month by the Discovery Programme. Tara, The Guidebook by Mairéad Carew is a richly illustrated guidebook on Tara, full of interesting facts, observations and insights about one of the most important archaeological sites in Ireland. Mairéad Carew is a cultural historian and archaeologist, and the author of Tara and the Ark of the Covenant (The Discovery Programme/Royal Irish Academy, 2013). She was an Irish Research Council / Government of Ireland Scholar in the School of History and Archives in University College Dublin from 2005 to 2008. She is also a creative writer and was winner of the Listowel Writers’ Week Award and was shortlisted for a Hennessy Award. Mairéad Carew’s new book asks questions such as who built Tara and why? 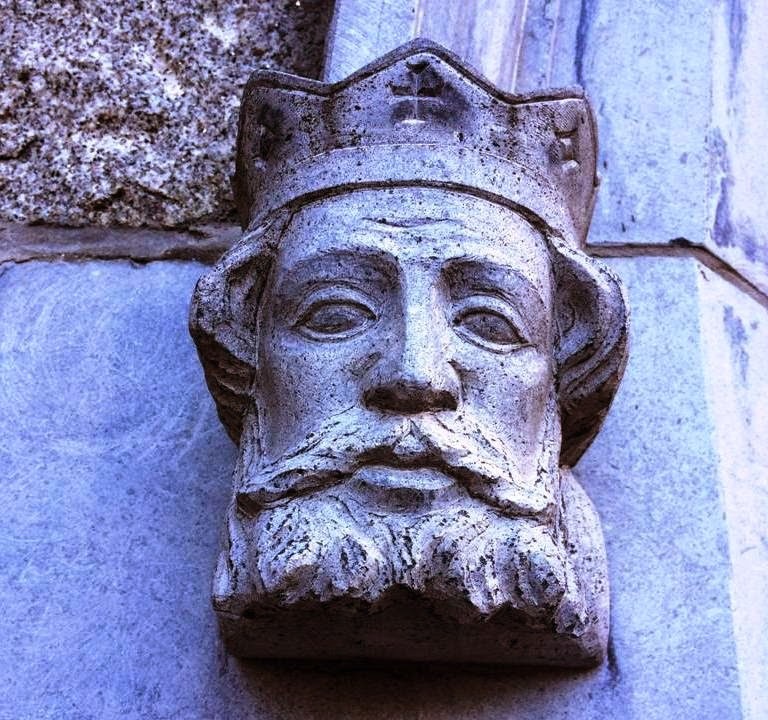 Wat did Saint Patrick do at Tara? Who was Niall of the Nine Hostages? She writes about Daniel O’Connell’s ‘monster meeting’ at Tara in 1843, tells the story of the Tara Brooch, which was discovered in the sands at Bettystown, Co Meath, and not on the Hill of Tara, how Queen Victoria wore a copy of the Tara Brooch, and the story of the British-Israelites dug up the site of Tara in search of the Ark of the Covenant. On the way to an ordination in Saint Columb’s Cathedral, Derry, two of us stopped for lunch on Sunday [4 September 2016] in the village of Sion Mills, about 5 km outside Strabane, Co Tyrone. The Stables Restaurant reopened recently in the former stables of Sion House, and the building is one the 41 listed buildings in this picturesque model village, which has been listed as a Conservation Area since 1977. The linen village of Sion Mills was founded by the Herdman family in 1835. It is one of the earliest Conservation Areas in any part of Ireland, and includes important heritage buildings in need of care and protection. After lunch, we took a short stroll through the village, before returning to look at Sion House, which was built by the Herdman family who also built the mills and the village. Today, Sion House is in a sad state of neglect and poor repair and must be considered at risk of loss. But looking at the house from the gardens in the afternoon sunshine of a late summer Sunday, it was possible to imagine the former grandeur of this Elizabethan-Revival mansion built in the 1840s and rebuilt in 1883 in a half-timbered style for Emerson Tennent Herdman (1842-1918). Sion House was originally a three-bay square house built in 1845 by the leading Irish architect, Charles Lanyon. 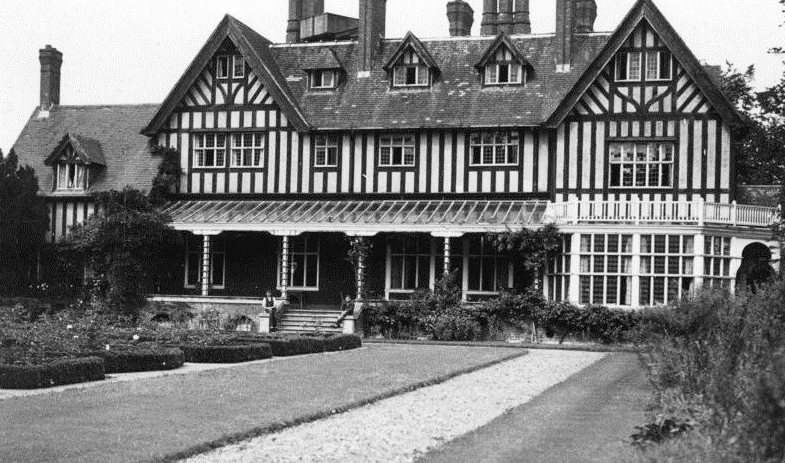 When the house was rebuilt in the 1880s, the architect was Herdman’s brother-in-law, William Frederick Unsworth (1851-1912), of Petersfield, Hampshire, who had worked for both George Edmund Street and Burges before opening his own office. At the same time, Unsworth was designing the first Shakespeare Memorial Theatre in Stratford-upon-Avon – although this was destroyed by a fire in 1926. 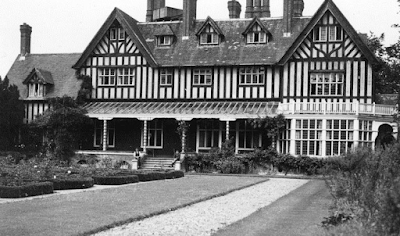 At Sion House, he remodelled the stuccoed Italianate house as a half-timbered Tudor mansion, and also designed the entrance gate, bridge and grounds, as well as the fittings and principal furniture. The gatehouse, also designed in the Elizabethan-Revival style, is virtually a replica of the gatehouse at Stokesay Castle in Shropshire. The house was approached through an ‘Old English’ gatehouse that included a porter’s residence and covered porch over the roadway. The wooded grounds had been laid out thoughtfully over the years, with glimpses of the house reflected in artificial ponds formed in a ravine crossed by a two-arch stone bridge. The house was crowned by the rich colouring of the red tiled roof, diversified with quick pitched gables, quaint dormers, and moulded red brick chimneys. 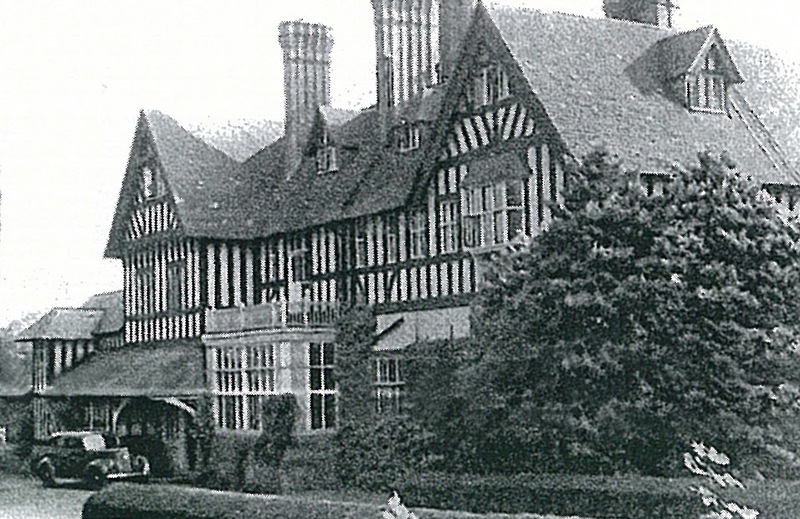 The house was rebuilt in a half-timber Tudor style. The principal entrance was on the north side, through a veranda, supported on open carved brackets. Here was an old oak settle, elaborately carved and interlaced with natural foliage in bas-relief. Reports in the 19th century described how the enclosed porch led into a spacious panelled hall, with an old-fashioned staircase, open fireplace, and wood chimney-piece, with over-mantel extending to the height of the panelling. The screens enclosing the entrance porch, as also that from the garden entrance to the south-east side, were filled in with lead lights, glazed with painted glass, and emblazoned with national and industrial emblems, monograms and coats of arms. The billiard-room, which was in a semi-detached position, and entered from the east side of the hall, was very characteristic of the style of the building. The principal roof-timbers were exposed, forming the pitched ceiling into richly-moulded panels. The walls were wainscoted to a height of 5 ft in richly-moulded and panelled work. The open fireplace was lined with artistic glazed earthenware tiles of a deep green colour and waved surface, giving a pleasing variety of shadow, and was deeply recessed under a panelled many-centred arch, freely treated, forming a cosy chimney corner with luxurious settles on each side. On a raised hearth, laid with terra-metallic tiles in an intricate pattern, were wrought-iron dogs. The chimney-nook also had a little window, placed to offer views of the grounds. The reception rooms were on the south side. On entering the spacious drawing-room the panelled feature at the further end formed a frame to a mullioned bay window with patterned lead glazing. From the recess of the bay, a side doorway led to the slightly elevated verandah, enclosed with balustrade, extending the full length of the south façade, and leading to a conservatory on the south side, with a short flight of steps giving access to the tennis lawns. The dining-room was enclosed off this veranda by a handsome mullioned screen, with folding doors and patterned lead glazing similar to the drawing-room bay. The walls of this room were panelled and moulded in English figured oak, enriched with carvings. The fireplace was open and lined with tiles, in two colours, similar to those in the billiard room. The chimney-piece had an over-mantel of carved oak, with bevelled mirrors, and heraldic carved arms in the centre panel. The mullioned screen was masked by a carved oak arch capped with a moulded cornice. The ceilings were of elaborate workmanship, enriched in fibrous plaster, with moulded ribs in strong relief and with cornices. The floors were laid in solid oak parquetry. The library and morning-room were on the north side. The kitchen and domestic departments were on the west side. Upstairs, there were 16 bedrooms with dressing-rooms. Several bedrooms were formed in the main roof by the dormers that were a feature on the roofline. Below, the spacious basement ran the full length of the house. Outside, the features of the house included several balconies with views of the gardens and the surrounding mountains and valleys, as well as the village of Sion Mills and the Herdman flax-spinning mills. The gardens and grounds were laid out in terraces. The Herdman family first came to Ireland first in 1688 with a Captain Herdman from Herdmanston, Ayrshire, who fought with William III at the Battle of the Boyne and then settled at Glenavy, Co Antrim. Three Herdman brothers, James, John and George, inherited the Millfield Tannery in Belfast from their father, and went into partnership with Andrew and Sinclair Mulholland and Robert Lyons. They bought an unfinished flax-spinning mill in Co Tyrone from the 2nd Marquess of Abercorn and leased the site at Sion (or Seein, a Fairy Mound), by the banks of the River Mourne, where they established their mills in 1835. It is not known how the spelling changed from Seein to Sion. Abercorn’s land agent, Major John Humphreys, who refers in all the negotiations on the lease to ‘Sion Mill,’ was the father of the hymn writer, Mrs Cecil Alexander. James Herdman married Elizabeth Suffern of Belfast, from a Huguenot linen family, John married Elizabeth Finlay of Belfast and had 14 children, and George married Anna Goudy, a descendant of the Revd James Porter of Grey Abbey, who was hanged for his part in the 1798 rebellion. The youngest brother, George Herdman, died of meningitis at Sion House in 1856. James Herdman (1809-1901) continued to run Sion Mills alone until he retired to Bath in 1866 after an extra-marital affair ended in court and caused a widespread scandal. James Herdman left his two elder sons, Emerson Tennent Herdman (1842-1918) and John Herdman, in charge of the mill. Emerson Herdman lived at Sion House, which he remodelled, while John Herdman lived at Carricklee, outside Strabane. Meanwhile, the middle brother, John Herdman, was murdered at the age of 51 in Cliftonville, Belfast, in 1862. He was shot by William Herdman, the son of his second cousin who lived in Dublin, in a family row. William was judged to be insane and spent the rest of his days in prison on Spike Island, Cork. John Hardman had 14 children and the eldest son, Alexander Herdman, took over and ran the Wine Tavern Street Mill in Belfast, which he renamed the Smithfield Mill. Alexander and his wife, Selina Gosselin, died tragically at a young age of typhoid. But the Smithfield Mill continued to be run by John Herdman’s descendants until 1902, when a wall collapsed and killed many of the workers. James Herdman’s sons, Emerson Tennent Herdman and John Claudius (‘Jack’) Herdman, presided over growth of both the village and the mill. They built the Presbyterian Church, the School, the Men’s Institute, the Recreation Hall at the Mill and laid out the sports fields, including the famous cricket pitch, where Ireland bowled out the West Indies in 1969. The Church of Ireland parish church came later. Old Saint Saviour’s Church was built as a half-timbered church with a red-brick bellcote. It was a gift of the Herdman family to the village, and was designed by Unsworth and built by Ballantine. It opened on 29 May 1895. When Emerson Herdman died in 1918, his son, Commander John Claudius (‘Jack’) Herdman, a naval commander, and daughter-in-law Maud Harriet (Clark-Kennedy) moved into Sion House. Commander Herdman’s daughter, Ella (Elizabeth Alice), married Brigadier General Ambrose St Quentin Ricardo (1866-1923), who became a director of Herdman’s. General Ricardo was born at Gatcombe Park, Gloucestershire, now the country house of Princess Anne. He was a descendant of the political economist David Ricardo (1772-1823), once MP for Portarlington (1819-1823). General Ricardo married Ella Herdman in Thyet Myo in Burma, which was then part of the Raj. They returned to Sion Mills in 1903, and he was largely instrumental in building a new Church of Ireland parish church for the village. The Church of the Good Shepherd was built in 1909 in an Italian neo-Romanesque style. Unsworth based his design for the polychrome church on a church in Pistoia in Tuscany. During World War I, Ambrose Ricardo raised and commanded the 9th Battalion of the Inniskilling Fusiliers (the Tyrones), which was practically wiped out at the Battle of the Somme in 1916. Ambrose and Ella Ricardo carried out many improvements to the village. But he drowned tragically drowned in the village reservoir in 1923, and was buried in the tomb in the centre of the village in front of the Church of the Good Shepherd. Sion House was sold in 1966. Today, although the house is still lived in, it appears to be in a sad and depressed state of the neglect and dereliction. The verandas and the conservatory have long disappeared, and parts of the front façade and the side walls are patched up with concrete blocks. The former gatehouse is also falling in and has been fenced off from view. We left Sion Mills for Derry on a happy note, though. Saint Columb’s Cathedral is closely associated with the hymnwriter, Cecil Frances Alexander (1818-1895), whose husband, William Alexander (1824-1911), was Bishop of Derry for almost three decades (1867-1896) before becoming Archbishop of Armagh. She wrote her famous hymn, ‘All Things Bright and Beautiful’, when she lived in nearby in Camus-juxta-Mourne Rectory in Strabane. The rectory overlooking the weir on the River Mourne at Sion Mills was a Georgian house later owned by the Herdman family. The River Mourne is ‘the river running by’ and ‘the purple headed mountain’ is Meenashesk, a hill to the east of the village. Sion House is an integral part of Sion Mills and its architectural heritage. Hopefully, its listed status and the importance of the village as a Conservation Area mean it can be rescued and lovingly restored before it deteriorates further.